Shirts With Random Triangles: Lane Kiffin is an ex-Alabama offensive coordinator, leaving school ahead of schedule. 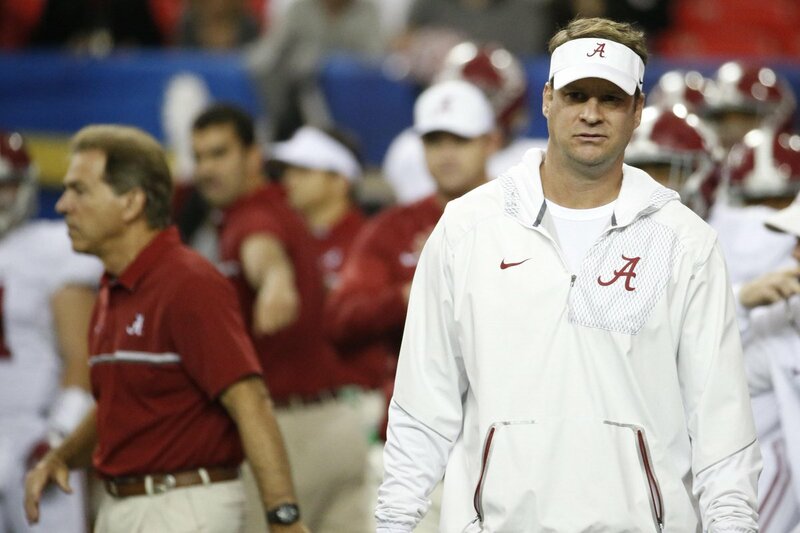 Lane Kiffin is an ex-Alabama offensive coordinator, leaving school ahead of schedule. Nick Saban and Lane Kiffin. Image via @CBSSportsCFB. Alabama just can't let New Year's Day go by without stealing headlines from the teams actually playing today, can it? The school announced Monday that outgoing offensive coordinator Lane Kiffin would be leaving the Crimson Tide coaching staff ahead of schedule, and would not take part in the team's defense of its College Football Playoff title on Jan. 9. Kiffin, who was named head coach of Florida Atlantic on Dec. 13, was previously scheduled to leave Alabama after the College Football Playoff title game. The earlier-than-planned departure was announced by Alabama head coach Nick Saban on ESPN Monday morning. "We made the decision because it was in the best interest of our players, our program and for Lane for him to assume his duties at Florida Atlantic," Saban told ESPN on Monday. "We mutually agreed that this was best for both programs." Steve Sarkisian, who had already been named as Kiffin's successor as Alabama OC, will now call plays for the Tide during the CFP title game. Sarkisian has served on Saban's staff as an offensive analyst during the regular season. Alabama will face Clemson for the College Football Playoff title on Jan. 9. The Poinsettia Bowl is an ex-bowl game. Sonny Dykes is an ex-Cal head football coach.